Through the generosity of a fellow collector (thanks Al) I recently acquired a group of 5 postcards which were mailed from ALA Library War Service camp librarians in WWI to the camp library in Camp Funston, KS. All of the postcards were published by the American Library Association and all depicted the camp library of the librarian mailing the card. The cards were from Camp Wheeler, GA; Camp Sevier, SC; Camp Lewis, WA; Camp Dodge, IA; and Camp Greene, NC. The librarian at Camp Funston was George W. Fuller. Three of the cards request a postcard in exchange from Camp Funston. Two just extend "Greetings". The card from Camp Wheeler (shown above) is signed by Frederick Goodell, and says, "May I ask you to send me a view of your library for a libraries exhibit?". 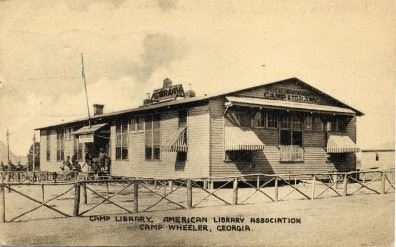 ALA published postcards of the exterior of almost all of its camp libraries in the United States, and some postcards of the interiors of camp libraries. 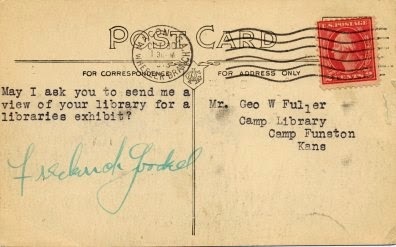 I have a collection that includes many of the camp library postcards. These 5 are especially nice since they are used and have a direct connection to the libraries. I have a couple of other postcards in my collection that request an exchange of postcards so I think this was a fairly common thing for camp librarians to do. Most camp librarians took a temporary leave from their regular library job to serve in this capacity. Almost all were ALA members and most continued their career as librarians after serving as a camp librarian. More information about the ALA Library War Service and its postcards can be found HERE. There will be no Link+ deliveries to Gleeson library from other libraries between Wednesday June 25th and Monday June 30th 2014. You can still request Link + books and media online via the library catalog Ignacio during that time. However, if you place a request that would otherwise be delivered for you that week, expect a delay. We hope to have all delayed requests delivered between Tuesday June 30th and Wednesday July 1st. As soon as your books are ready to be picked up, we will send you an email notice. If you have any questions, please feel free to give us a call at 415-422-2662 or stop by the Gleeson Circulation desk. "Will you accept appointment official representative American Library Association Vladivostok to develop library service for American forces in Russia? Books being shipped steadily. Will meet all expenses and guarantee against salary loss. Cable Libcon, Washington." Clemons responded the next day with, "Will attempt library service when you direct. University desires my return by May." Thus began what must be one of the most amazing efforts by a single individual on behalf of the American Library Association. I have written previously about the work of Harry Clemons in Siberia, but recently I became aware of an envelope (shown above) mailed by Clemons shortly after his arrival in Vladivostok. This prompted me to do another post. One of the specialties in philately is the collection and study of military postal history. Examples of envelopes mailed by men in the American forces in Siberia during World War I are among the scarcest and most sought after by collectors. The envelope above may be the only envelope mailed by Clemons as ALA's representative in existence in private hands. It is part of the collection of Al Kugel, one of the world's most respected military postal historians. I appreciate his letting me use the image of the envelope in this post. 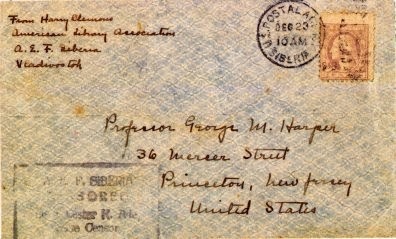 Clemons mailed many letters to the American Library Association while in Siberia and they were compiled in a book titled appropriately The A.L.A. in Siberia. A copy of the book can be found on the Hathi Trust site. In the foreword to the book H. B. Van Hoesen who edited the book noted that Clemon's report on his work to the Commanding General "shows the activity as well as the activities of the A.L.A. Library War Service in Siberia; how in five months, one man was able to handle some ten thousand volumes (plus 10 boxes, 194 parcels, 75 mail sacks, not counting discarded magazines), unpacking censoring, sorting, cataloguing, and repacking; to distribute and organize these into a system of over fifty branches scattered all the way from the Yangtse Valley to no one knows how far towards the German frontier (not to mention gift distribution); and at the same time to act as reference department and superintendent of no inconsiderable circulation; and, on top of all this, to produce, in slow longhand manuscript, and in spite of obstacles like frozen ink, etc., a series of reports of real historical value among the chief literary "by-products" of the Library War Service." The compilation of Clemons letters was distributed to all the attendees of the 1919 ALA Conference in Asbury Park, NJ. After his service in Siberia Clemons returned to Nanking University where he worked until 1927. He then became Librarian of the University of Virginia Library in Charlottesville,VA where he worked until his retirement in 1950. Clemons is included in the Dictionary of American Library Biography (Libraries Unlimited, 1978). Thanks to the Professional Development Leave program, USF’s Gleeson Library librarians are eligible to apply for a research leave to engage in intensive research. For my professional development leave in 2012 I created Habobib, a bibliography of publications by and about Habonim Dror, an international Jewish youth movement. In conjunction with formulating the bibliography, I also began the process of developing an online repository of Habonim Dror publications. Habonim Dror (the Hebrew for “Builders of Freedom”) is a socialist Zionist youth movement that educates youth around the globe about Jewish culture, progressive Zionism, socialism, and social justice. The organization Habonim Dror was formed in 1982 by the merger of two historical youth movements: Habonim, which was founded in Great Britain in 1929, and Dror, which was founded in 1915 in Russia. This merged organization now has chapters all over the world. I attended Habonim Dror summer camps and have strong ties to the organization. The professional development leave thus provided me with the rare opportunity to engage in original scholarship in a subject that combines my personal and professional interests. The leave allowed me to immerse myself in this research endeavor and provided intellectual space for reflection on the underlying political conflicts embedded in progressive Zionism and therefore Habonim Dror’s history. In order to find the publications for this bibliography I utilized a variety of strategies including contacting organizational headquarters in the United States and other countries, inventorying materials at Habonim Dror’s North American Central Office in New York, conducting research at the Center for Jewish History (also in New York) to obtain access to the archival and library collections of the American Jewish Historical Society and the YIVO Institute, reaching out to Habonim Dror alumni, and scouring various online databases and websites. I used RefWorks to compile the Habonim Dror bibliography and RefShare (a component of RefWorks) to provide online, public access. Habobib is now live and consists of over 300 unique entries. The records in Habobib contain links to digital versions of publications when available, as well information regarding libraries or archives that hold the items, and annotations to provide context and additional information. The professional development leave was a truly gratifying experience and has laid the foundation for this ongoing project. The Habobib bibliography and online repository continue to be works in progress. I add publications as I discover them and as new sources are published. The part of the research I’ve enjoyed most is the discovery of rare and old publications from Jewish communities across the world. It has honestly felt like a treasure hunt, and the hunt has not yet grown old. Speaking of which, the image at the top of this post is the cover of a Romanian publication from 1945 that I just found last week. While collecting postal librariana I have managed to acquire many examples of one of the most common forms of library communication - the overdue library materials notice. I've written previously about my large collection of overdue notices on postal cards. I've also written about the oldest overdue notice in my collection. Recently I acquired a much older overdue notice. It is shown above and it was mailed on Jan. 7, 1832 by Sir P. Dun's Library in Dublin, Ireland. The Librarian was Thomas Herbert Orpen and he courteously ends the overdue message with " I am your obedient Servant". 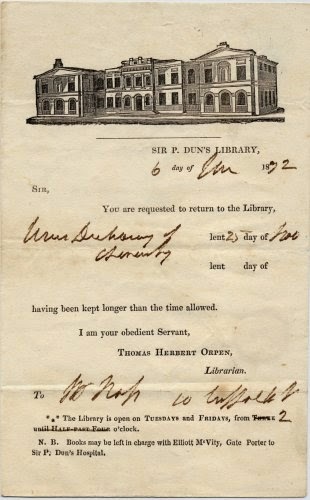 The library was part of Sir Patrick Dun's Hospital whose building is shown at the top of the overdue notice. Sir Patrick Dun (1642-1712) was a prominent Irish physician who left an endowment in his will that resulted in the establishment the hospital in 1800. The hospital ceased operation in 1986. Dun also built an extensive personal medical library that is now part of the Royal College of Physicians Library in London which also houses the archives for the hospital.